In general the Bills did a very good job taking players and filling their needs. Sean McDermott is a defense-first guy and it’s no surprise to me that after they picked Josh Allen the next four picks were defense. When in doubt he was going to error on the side of making sure the defense was fortified first. The Bills, under this current regime, will not take a player with a red flag for attitude. This is different from Doug Whaley. Whaley would take a chance on guys with talent that had character issues. Brandon Beane and McDermott will not take any of these guys. This is what they mean when they are talking about a good fit for the Bills organization. There were no throw away picks in this draft. Everyone they picked will get a chance to contribute right away except Allen. Ironically the player that will define this draft will be the one that plays the least this year. The ideal scenario is one that mimics the KC Chiefs last year with Patrick Mahomes. Allen looks great in preseason, in practice and in a token start at the end of the year. The Bills do well and make the playoffs with AJ McCarron as QB. The Bills then trade McCarron for a nice draft pick and hand the job to Allen next year. This gives Allen a chance to work on his two main flaws. Accuracy because of poor footwork and reading the defenses quickly. Fans will handle a red shirt year as long as the team is doing well. McCarron needs to play well and not force the Bills hand early on Allen. Great move-up for a guy they never thought would be there at 16. The Bills get their Luke Keuchly type LB that can cover anyone and run sideline to sideline. Maybe the best athlete in the draft. He’s their best LB from day 1. This was the biggest hole to fill this year. Remember much has been made about this being Kyle Williams last year, it may be Lorenzo Alexander’s last year as well. The Bills linebacking corp looks a lot better with Edmunds name in the group. Another player that comes in and contributes right away. He is versatile so I can see him replacing Star Lotulelei or Kyle Williams. Note in the press conference they mentioned him as an ideal one-technique guy. That’s Star’s position not Kyle’s. Every analyst talked about how he’s Kyle Williams replacement. I feel they think he’s versatile enough to fill in for both positions inside. Neal gives a little more flexibility than Johnson because I feel that Neal can play safety or corner. Johnson comes in from day one and competes for the nickel corner spot. The secondary needed depth. The Bills had good starters coming into the draft but were paper thin behind them. Both of these guys will be on the field a lot if they can play because guys in the secondary are often banged up. Look at EJ Gaines last year. You need to go into the season with 10 defensive backs you have confidence in. 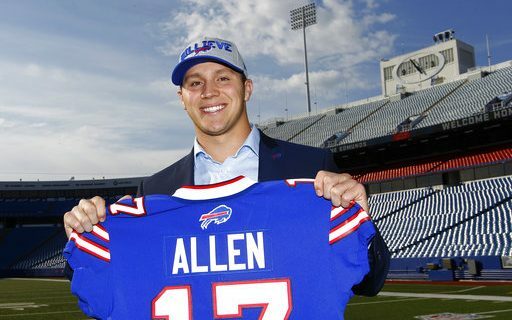 Before the draft the Bills had five or six at best. Love this pick. He’s a big guy with great strength. Can’t wait for the collision between him and Harrison Phillips on the field. Both are kings of the bench press. Teller isn’t going to be bull-rushed by too many guys. I never was a big fan of Vlad Ducasse last year. I feel that Teller has a chance to come in and compete for a starting guard position right away. This is assuming that Ryan Groy takes Richie Incognito’s spot. Like above what I said about defensive backs. You need to go into the season with 9 offensive linemen you have confidence in. The Bills had no depth in the interior of the offensive line at the start of the draft. I hope Teller starts and can push Ducasse to a back-up role. This would be an improvement from last year. Both these receivers give the Bills much needed speed. Now its speed in different ways. McCloud gives you the straight line speed that this team has been lacking since Marquise Goodwin left. He could stretch a defense. Proehl gives you the elusive speed from the slot, just like his father Ricky. The Bills receivers are maybe the worst in football. Other than Kelvin Benjamin it’s hard to count on anyone. Zay Jones needs to respond with a much better sophomore season. After those two I see no one that has a clear roster spot. McCloud might be their main return man since Brandon Tate is still a free agent. It would be nice if Proehl emerges as that Chris Hogan, Wes Welker type of slot threat.